Whenever people ask me for fine dining recommendations in LA, Providence has almost always been the first place that comes to mind. Since opening in 2005, the restaurant has firmly established itself as one of the premier dining destinations in the Southland, and its chef, Michael Cimarusti, has been universally hailed as among the City's finest. 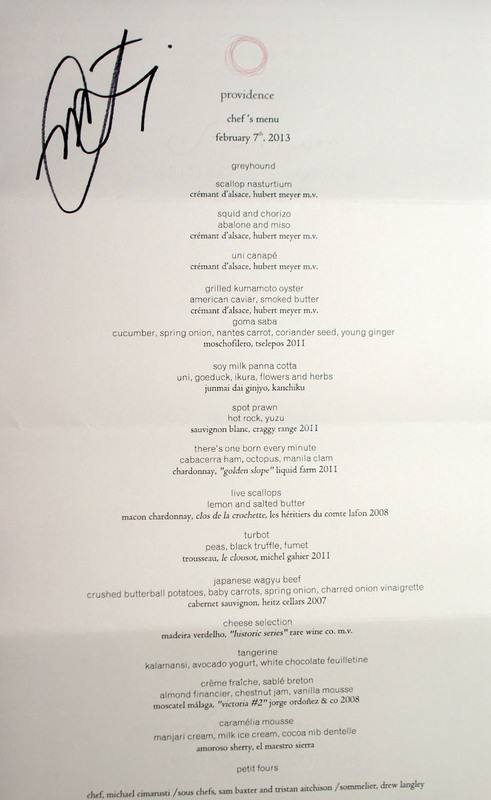 And I want to emphasize universally; people in this town seem to love to talk trash about chefs (Ludo, Mike Voltaggio, and David Myers seem to draw the most ire), but I've never once heard anyone speak negatively about him--that should tell you something. Though I've been to Providence seemingly numerous times for special events, my last "real" meal here was way back in 2009, and that's just not right. As such, a revisit was long overdue. For this evening, we ended up with a whopping 15 diners, the largest party that I'd ever organized. Because of that, we booked the Sonoma Room, a private dining room that seats 16 (note a minimum charge of $3,000 for Thursday nights). 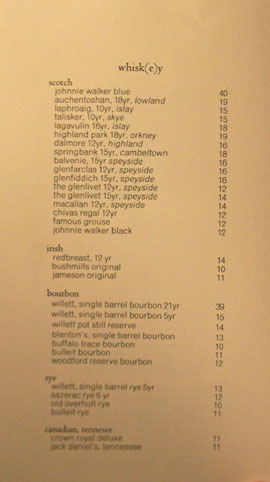 For even larger parties, there's the option of the Cellar Room, which handles up to 22. 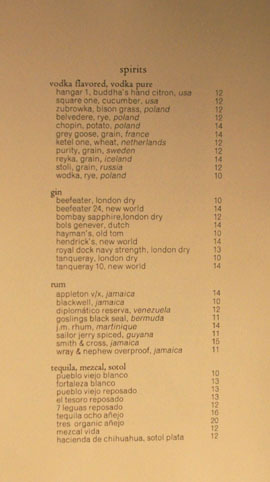 Arriving early at the restaurant, I was handed Providence's comprehensive drink list and soon found myself perusing the cocktails (I believe now the work of Laura Lindsay, following the departure of Zahra Bates). 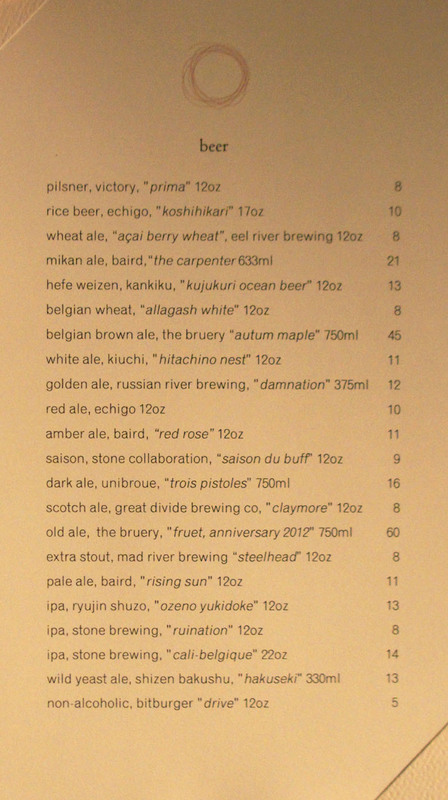 If that's not your thing, the beer and spirit selection here is also surprisingly well-curated. Click for larger versions. Unsurprisingly, I wound up with the Like Eskimos (hey, it had truffle in it!). 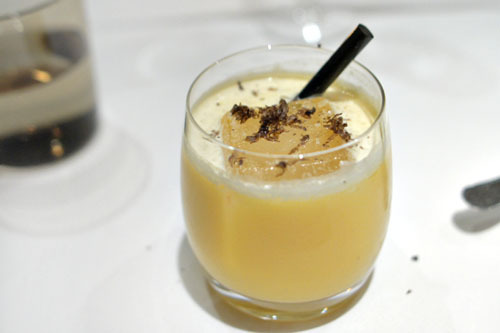 It really was delicious though: creamy, eggy, redolent of earthy Périgord on the nose, and with a tinge of sweet spice that all paired beautifully with the drink's base of cognac. 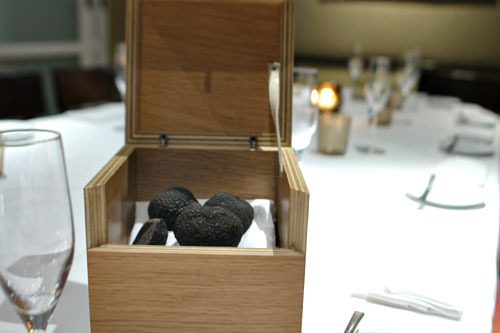 I loved the whole pomp and circumstance with the presentation of the truffles, too. 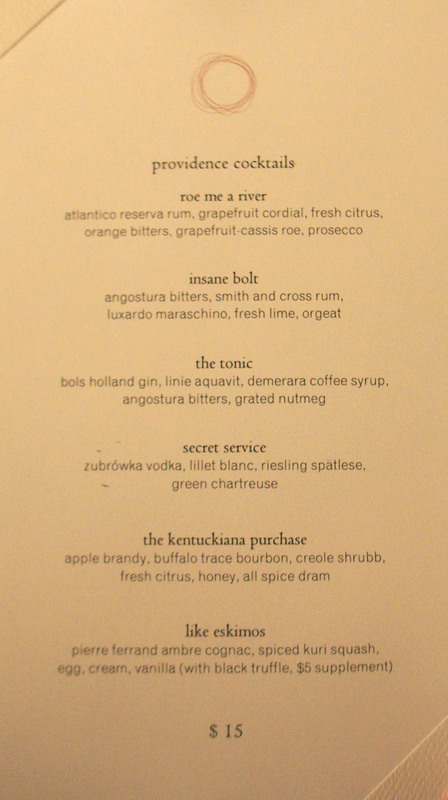 And here we see Providence's flagship Chef's Menu, a 16-course extravaganza at $175 per head, plus $115 for optional wine pairings from Sommelier Drew Langley. Click for a larger version. 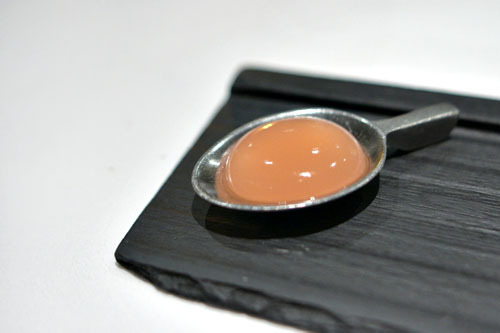 We began with the restaurant's signature amuse bouche, a spherified (or reverse spherified, most likely) Greyhound cocktail containing vodka and grapefruit juice. It showed off a bright acidity initially, leading to a mix of fruity and alcoholic notes on the midpalate. A fun burst of flavors. crémant d'alsace, hubert meyer m.v. 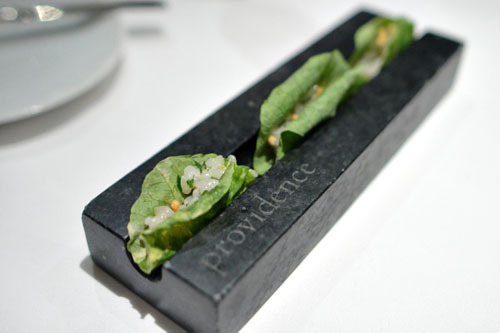 Another, newer mainstay on the menu is the whimsical Scallop Nasturtium, basically diced kombu-cured scallop and sushi rice in a nasturtium wrapper. 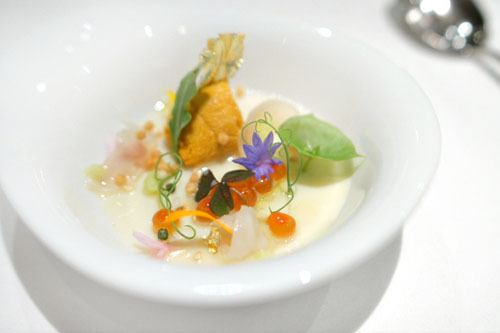 It was a marvelous, perfect little bite, with the sweet, creamy scallop melding beautifully with the rice, then taken up another notch by the crunchy, savory bits of rice cracker sprinkled within. The nasturtium, meanwhile, contributed a delightful tanginess on the finish that balanced out the dish in stellar fashion. 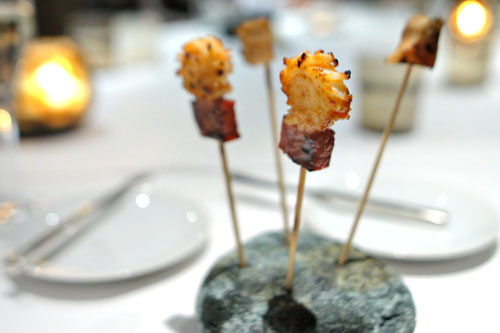 Up next were binchotan-grilled skewers that I'd last encountered at the OAD dinner in 2011. I first tried the Monterey abalone, done up with dashi and miso. It was superb, with a fantastic sweet-savory interplay from the miso and a delightful char character; lovely texture, too. The Japanese sword squid and chorizo skewer was arguably even better, with a mouth-watering kick of spiciness from the sausage that paired wonderfully with the subtle, tender squid. 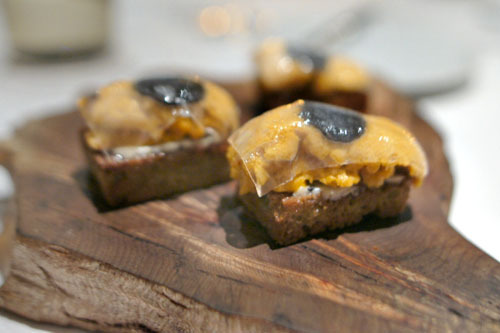 The parade of hits continued with these bites of Santa Barbara uni, black truffle butter, and lardo de Bellota, all served on rectangles of focaccia. Unsurprisingly, they were delicious, with the creamy sweetness of the urchin playing perfectly off of the in-your-face smack of the lardo-focaccia combo. 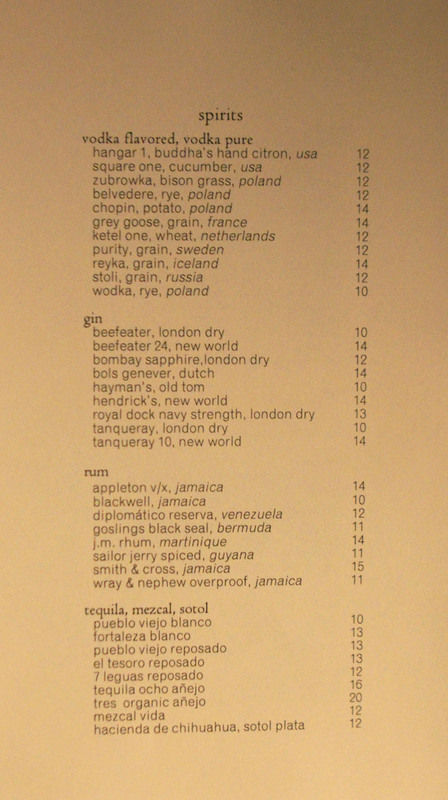 Some great transitions of flavors here, and one of my dining companions even likened the taste to eating "fried uni." 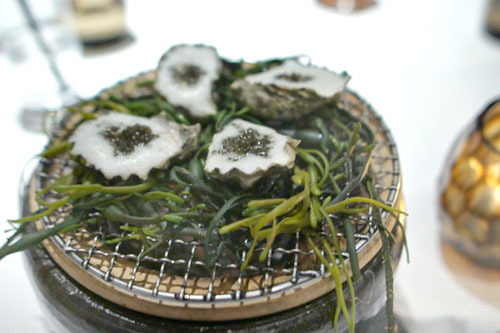 Kumamotos arrived in a bed of seaweed, topped with a Champagne beurre blanc and Alverta caviar. The dish showed off classic oyster flair, with a mélange of creamy, rich, briny flavors set off by sharp pricks of salt from the sturgeon roe. 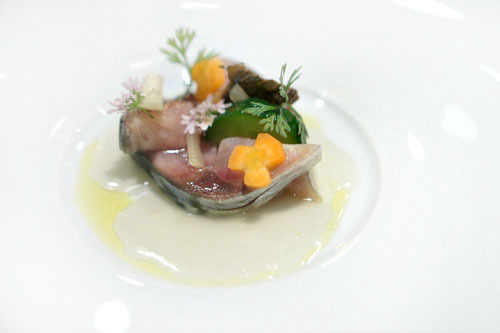 Mackerel was marvelous, displaying a clean, focused, yet subdued salinity that perfectly matched the tart, crunchy pickles, all while the finish lingered on and on with the relish of the ocean. 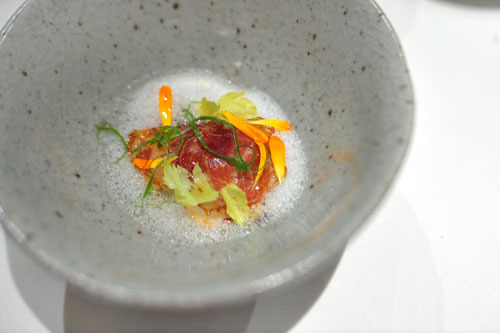 A flawless marriage of flavors and textures--I do not hesitate in calling this the best saba that I've ever had. 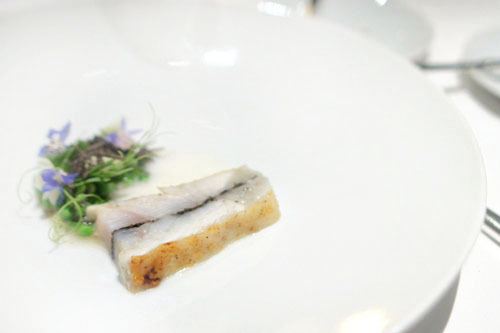 Our next course was a redux of a dish Chef Cimarusti presented at 2011's Ibaraki benefit dinner at Breadbar. It was a beautifully composed plate, with the three types of seafood taking center stage and conveying some pure, unmitigated flavors that really tasted of the sea. I especially appreciated the firm, crunchy texture of the geoduck. 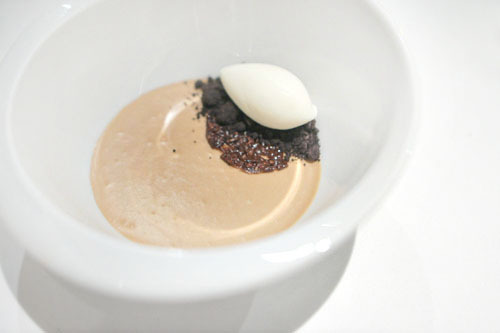 To that, the soymilk panna cotta offered up a lush, creamy counterpoint, moderating the dish in effect, while the crunchy little bits present really added some well-placed savory accents to the fray. 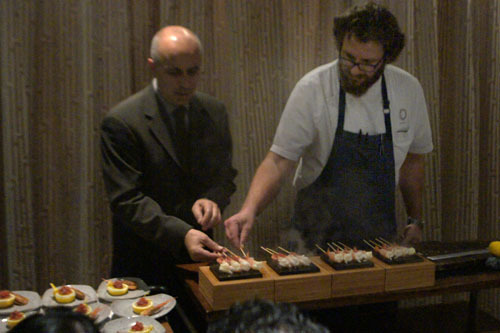 Here, Providence GM/Co-Owner Donato Poto and a particularly hirsute Cimarusti (his "winter coat") made their first appearance to present and cook some beautiful just-in-season spot prawns. Cimarusti and company are known for their adept handling of spot prawns (particularly the salt-baked variety), and the version we had tonight did not let them down. Cooked briefly on hot stones, they were finished simply with a dash of yuzu, resulting in just about the purest, freshest, most profound expression of the ingredient possible, with a fantastically snappy texture to boot. The prawn roe, too, was tasty, with a lovely piquancy to it, and I really appreciated the head as well, with its smokier, weightier facets. Despite the abstruse moniker, the risotto of octopus and clam managed to be a table favorite, and for good reason. The rice was spot on in consistency, and served as a flawless base to the tender, sweet bits of seafood strewn within. If that wasn't enough, the slices of ruby Ibérico neck ham added further layers of spice, savor, and complexity, while the entire amalgam was enveloped by a certain lightness courtesy of celery. A bigger bowl, please! Live New Bedford scallops were presented with their adductor muscles still attached to the shells, and served simply with French fleur de sel butter (Rodolphe Le Meunier's Beurre de Baratte), salt, and lemon. I was afraid that the butter would overwhelm the bivalve, but that simply wasn't the case. 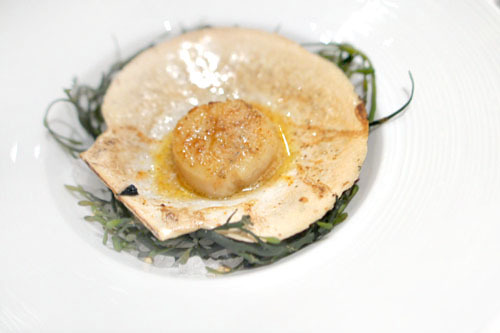 Rather, it provided a richness and depth to the dish that melded gorgeously with the inherent sweetness of the scallop, all while a slight touch of char added further interest to the course. At this point, a magnificent filet of Brittany turbot, replete with truffles, was brought out to the table for us to take a gander at. After being plated, the turbot was brought back outside, accompanied by a pea salad and Périgord fumet. 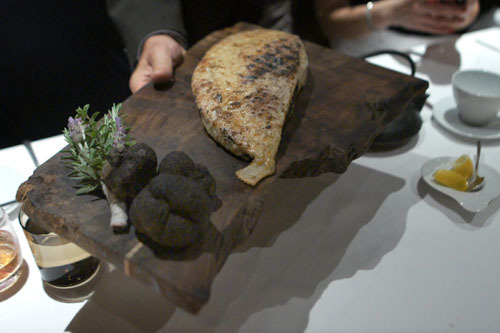 The fish was beautifully done, with a soft, delicate flavor that was keenly augmented by the Morbier-esque line of black truffle within. It was a smart combination of two disparate elements, and I absolutely adored the pea here too, which showed off some bright, verdant flavors that really set the dish off. Despite being a seafood-centric chef, Cimarusti has always had a knack for cooking up some of the best steak I've ever tasted, and tonight was no exception. What we had, thus, was real deal Japanese wagyu, grade A5, from Kagoshima Prefecture. It was pretty much flawless: melt-in-your-mouth tender, loaded with all the beefy, fatty flavor that you'd expect, and with a fantastic twang of char bitterness. One of my dining companions declared this the best steak he'd ever eaten, and I believe him. As good as the meat was, the accompaniments made sense, too. The Yorkshire pudding was runny and rich, comforting really, as were the potatoes, while the carrots made for a fitting touch of levity to the dish. madeira verdelho, "historic series" rare wine co. m.v. 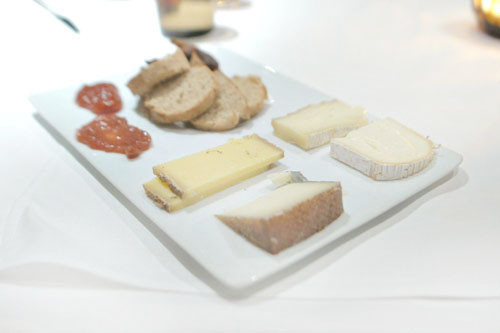 Providence's cheese cart is one of the best in the City, and we were able to enjoy four selections from it. Going counterclockwise from bottom-right, we had Casatica di Bufala (a creamy, soft, Italian water buffalo cheese with a mushroom-y character), Nuvola di Pecora (Italian sheep's milk with an earthy flair), green label Comté (raw cow's milk--sweet and caramel-y), and Dallenwiler Geisskase (a nutty Swiss goat cheese). Joining the fromage was housemade bread, quince and rhubarb jams, candied walnuts, and dried figs. Moving now into the sweet stuff, we began with a sort of pre-dessert. 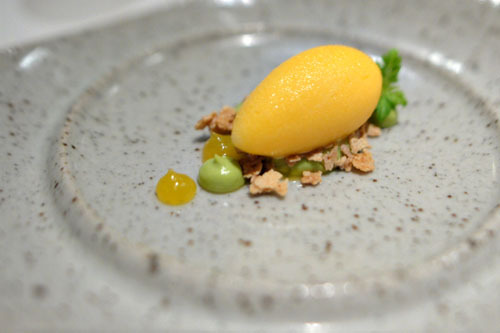 A flawlessly smooth quenelle of tangerine sorbet was a jolt to the palate, putting forth some really bright, citrus-y flavors, moderated in part by the lushness of avocado, all while the feuilletine added texture and a nice savory tinge to the dish. Great as a palate cleanser. 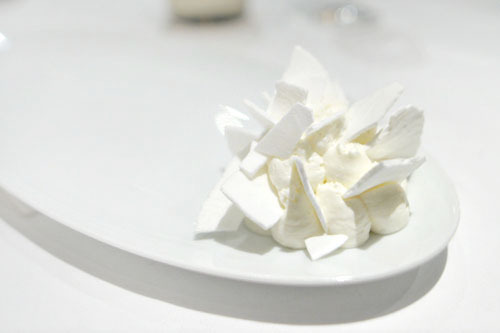 Here we had the kitchen's riff on the classic Mont Blanc (whipped cream-topped chestnut purée), but done up in a visually-striking all-white visage. The dessert conveyed a marked sugariness up front that reminded one of my dining partners of "cupcake frosting." Balancing that out was the chestnut jam and slightly savory financier, all while the crème fraîche provided an undercurrent of tanginess. Last up was a dual-layered mousse containing both Valrhona Manjari dark chocolate and Caramélia milk chocolate. It was actually overly sweet for me, and I would've liked some herbaceous or fruity notes to balance things out a bit. That being said, the milk ice cream did deliver a temper to the dessert, and I quite appreciated the textural aspect of the dark chocolate streusel and cocoa nib tuile. 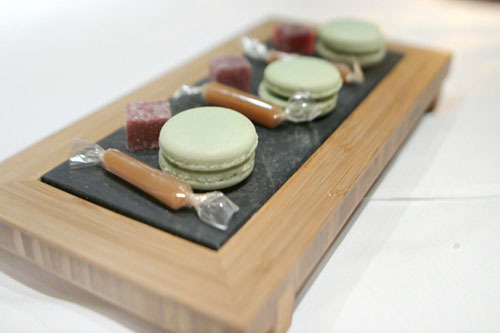 To close: peppermint macarons, caramels, and raspberry-tarragon pâtes de fruits. A return to Providence was long overdue, but I'm really glad I made another trek out here. The food was even better than I remember, and it was fantastic to see how Cimarusti's cooking has progressed over the years. If anything, it's become even more precise, even more focused, with a cleaner, more ingredient-centric aesthetic and an acute nod to modernity. In a way, the plates are simpler, yet more profound, with boatloads of finesse and a palpable purity to them. 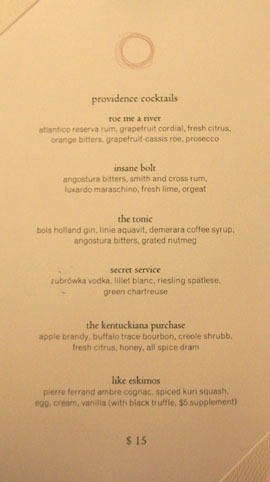 If that wasn't enough, the beverage pairings by Drew Langley were top notch, and the service was to be commended as well. A lot of people call Providence the best restaurant in LA, and they might just be right--it's a must visit for Angelenos and foodie-focused out-of-towners alike. That all white desert was my favorite last time I visited as well, about a year ago. The uni and truffle toast was also a hit when I visited. Like you said it had that smooth transition of flavors, for me it was between the uni and truffle, both complex in their own right and yet so harmonious. Jipeng: Not sure I agree with that statement, but I'll take it! Anon: It's a bit disheartening to hear that you had the same dishes a year ago, since I'd like to see more change in the menu. But then again, we're not talking about the "main" dishes here, so I suppose it's alright. Anon: Probably never unfortunately. I don't have much of a wine cellar any more. A few years ago, when I was actively buying and selling, it was pretty crazy though, filled with DRC, First Growths, vintage Champagnes, and California cabs. I don't really cook, either, so that's a bit of a non-starter as well. 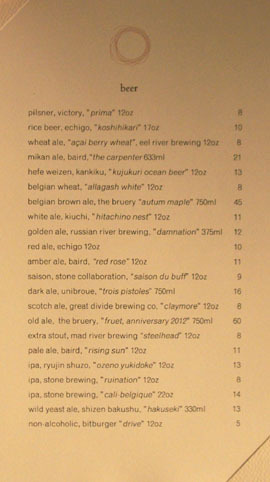 I went to this restaurant and had the nearly same menu couple weeks ago. Dissapointment would be too harsh. 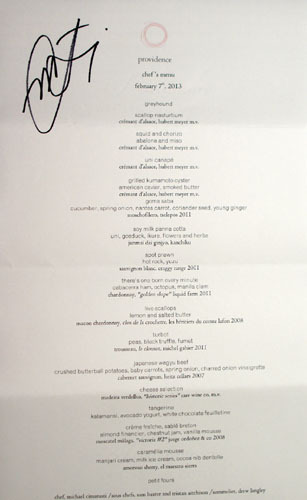 Certainly, it was not upto my expectation, which was mainly because of its 2-star Michelin rating. 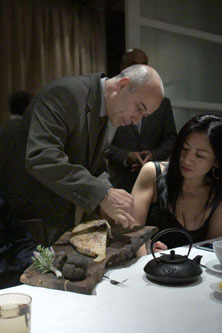 I expected something like Guy Savoy in LV. No, no where near that level. Service was simply sterile. Sure, they delivered everything in time, pour your water and wine, crumb your table. 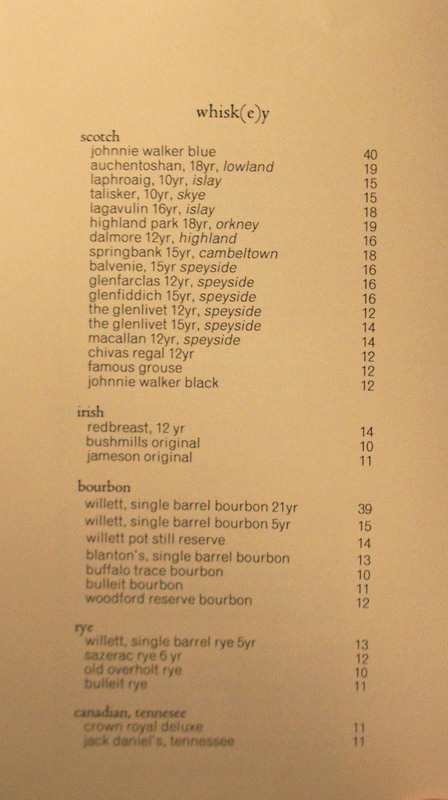 But no wit, no entertainment, no enthusiasm, no character, except the wine director who was really great. Overall, again, sterile. It maybe different if you sit in the private diningroom.